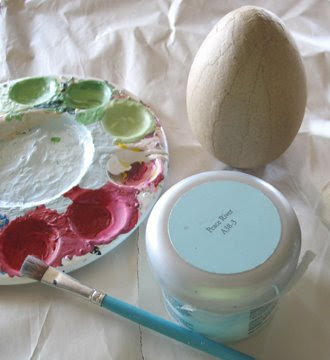 I saw these papier mache eggs at the craft store and couldn't resist a simple transformation: First came two coats of aqua acrylic paint to each one. Then I super-glued some pearl beads into a cross shape. I have a set of little pewter vases, so I cut some pieces of white ribbon to lay across the top as a finishing touch. 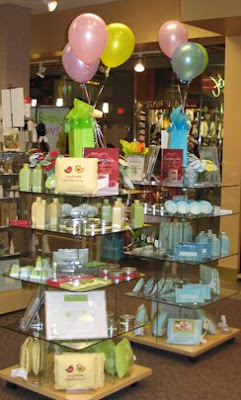 I also have to give a "shout out" to the fun girls at Hallmark Coach House Gifts: Where I did a signing last Saturday for my Simply Inspiring collection: They were so sweet! Thank you! Oh Jeanne...I truly adore you so much! Another great idea! You are truly gifted by our FATHER. Thank you for sharing your ideas with us. You have such a creative and generous heart. iLoveYou, my dear co-heiress in CHRIST! 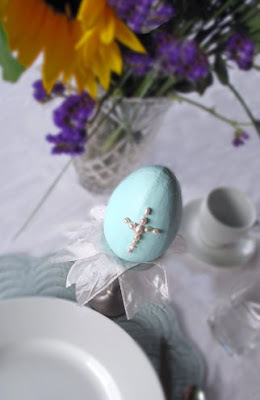 We love the pearl cross on the egg... looks great! Wow, Jeanne! I find your work and achievements very inspirational! These eggs are just so precious and thank you so much for sharing! 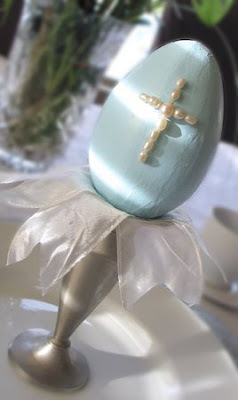 That is a lovely idea for Easter, very creative, thanks for sharing.